Elianna is a young girl crushed by guilt. After her only brother is killed while in her care, Elianna tries to earn forgiveness by working for her father's textile trade and caring for her family. When another tragedy places Elianna in sole charge of the business, her talent for design brings enormous success, but never the absolution she longs for. As her world unravels, she breaks off her betrothal to the only man she will ever love. Then illness strikes, isolating Elianna from everyone, stripping everything she has left. No physician can cure her. No end is in sight. Until she hears whispers of a man whose mere touch can heal. After so many years of suffering and disappointment, is it possible that one man could redeem the wounds of body ... and soul? Tessa has just been named 'New Author of the Year 2011' in the Readers' Choice Awards(sponsored by Family Fiction). Tessa was born into a nominally Muslim family in Iran and lived there for the first 14 years of her life. She survived English boarding school for girls before moving to the United States permanently. Her conversion to Christianity in her mid-twenties changed the course of her life forever. Tessa holds an MDIV from Yale University where she served as co-Chair of the Evangelical Fellowship at the Divinity School. She has spent the last twelve years in full and part-time Christian work and currently serves as the leader of Women's and Prayer ministries at a church in New England. Customer Reviews For "Land of Silence"
The story of the woman in Matthew 9:20-22 is very brief and is told in the middle of another scenario of healing in the Bible. 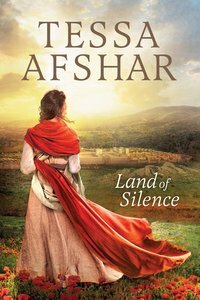 In Tessa Afshar's "Land of Silence", the author has done a wonderful job in giving a fictional insight into who this woman could have been in her day and what her condition could have meant to her. The story and struggles of the woman needing healing are told pleasantly. I love the part where Tessa starts to describe the woman's interaction and encounter with Jesus. Tessa has indeed made this a story of hope. This is a great book to read, for those studying Biblical studies, as Tessa's approach is creative story-telling. I really enjoyed this book. It is well written and helps you really imagine what it might have been like for the woman who reached out and touched Jesus. The characters are convincing and the story line is not what you'd expect. Another masterful tale from the very talented Tessa Afshar! I highly recommend it for anyone who enjoys a good story set in Biblical times. Flawless writing. Moving story. A new favourite author for me. I struggled a bit with having a whole book written about someone that we know so little about. In the end I decided that if the biblical bits were accurate, then I could just enjoy the wonderful story. Land of silence is a fascinating read about the woman who was healed of bleeding condition in the new testament. It was amazing to have the bible story come to life through the authors detailed story. It was very well written and it made me appreciate the society we live in today. It also explained the daily life of a jewish woman in Jesus' time and that gives great insight. It was my first read by this author and i wasnt disappointed. I love Tessa Afshar descriptive writing and the way that she can make you really feel the emotions of her characters. Tessa has used her imagination to create a reason for why it was significant that Jesus would call the woman with the 12 years of bleeding "daughter" when He healed her. Although there are great descriptions of life during this time in biblical history I personally found that there were far too many tragedies in this story to make it a really enjoyable one to read. If you love this type of story though it is very well written.